It seems that lately I have been allowing myself to "sweat the small stuff." Normally a positive person, I have been overcome with grouchiness and have been spending far too much time allowing myself to think about things that annoy me. I have been busy making disparaging remarks about traffic, traffic noise and development. I have let myself stew about my loathing for shopping malls and have taken my abhorrence for grocery stores to a level where I am avoiding them to the point of almost no food in the house (except for what I have preserved in my freezer and cold room and the bulk grains in my pantry). 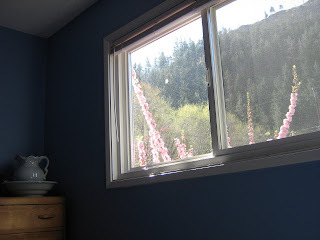 the pink bits you see are my double-flowering almond shrub and I love looking up at this mountain before I get out of bed - even though my neighbor tells me there is a cougar up there that just ate 3 sheep belonging to someone living nearby. That is where where we go for our walks all the time and it is a "favourite thing" for my dog. This is my favourite Spring interest plant. 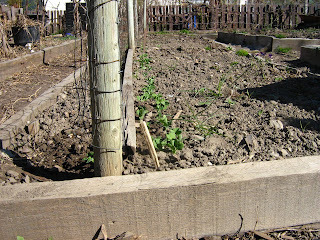 Well, better make that my favourite Spring interest shrub...I have other favourite spring interest plants. 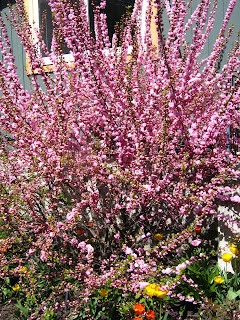 Actually, make that my favourite Spring interest, not very scented shrub because in a few weeks I will be posting pics of my lilacs and they will be my favourite scented Spring interest shrub. How fickle I am, but I will have you know that my boys are my favourite boys all year round, no matter how they smell or how lovely they look. 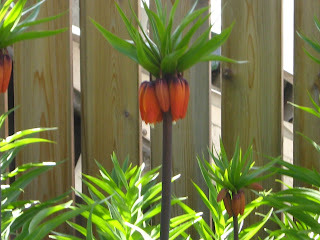 And this funny looking one is my favourite stinky Spring interest plant (Fritillaria) - it smells a bit skunk-ish , frankly and for some reason always reminds me of Dr.Suess. Am I the only one who thinks it looks like a Dr.Suess type plant - maybe you have to see the whole plant to get the idea. Samantha - I'll have you know that I went and changed all my "favorite"s to "favourite"s just for you!!! :o)Thank you Heather. I really, really enjoyed your post and it brought a smile to my face. I love your little almond shrub. I also love your Fritillaria. Mine are a lot smaller then yours but they are flowering as well and I visit them every day, encouraging them to spread and grow. There is something about Spring that makes Winter worth all the cold and dreary weather - welcoming the new green shoots of Spring always lifts my spirits and brightens my day. This is only the beginning. Enjoy the sunshine!! Easy to see why these lovelies would be favourites, Heather. 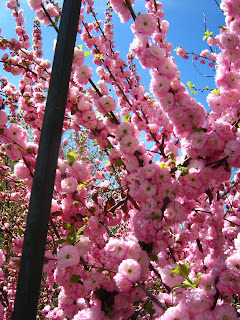 So much colour and prettiness - how can one not enjoy this season?